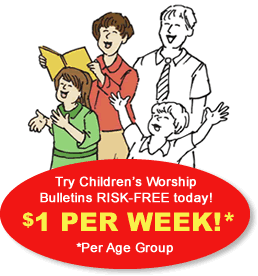 Children's Worship Bulletins bring the simplicity of biblically based lessons to children ages 3-12 in an engaging and educational format. Designed by professionals and reviewed by pastors of all denominations, Children's Worship Bulletins are suitable for use in any Sunday school classroom, to give as handouts at church events or to give to visiting families with children in your worship services. It's easy in today's culture to forget how simple it is to live as Christ lived. There's no better time than the beginning of a New Year to reflect on God's gifts to us and to prepare our hearts to live as His servants in the New Year. With our children's church bulletins about New Year's Eve help your children learn important lessons about being servants. In this short article, we show you how to create activities from our children's church bulletins about New Year's Eve to reinforce Christ's call for us to serve one another. Give each child a bulletin, crayons or colored pencils and a blank sheet of paper. Explain the activity, "I'm going to read our Scripture lesson while you complete the puzzle 'Whatever you do for others, you do for Christ.'" Read aloud Matthew 25:31-46 while the children work on their puzzles. Continue, "Now, I want you to think of three things that you can do for others in the New Year. On your blank sheet of paper, draw pictures of them." When the children have finished their pictures, allow them to describe the three things they thought to do for others and to show their drawings to their classmates. Children's church bulletin about New Year's Eve for ages 7-12: The righteous people asked Jesus when they had done all of these things for Him. What was his answer? Contact your church secretary about home-bound or elderly members of your church or call a few local homes for the elderly and ask if you & your children can create cards for their residents. Gather the first names of the elderly, the main contact at the nursing home who will distribute for you as well as the main mailing address. Read aloud or have the children read aloud Matthew 25:31-46. After reading the story, have the children complete the puzzle "The righteous people asked Jesus when they had done all of these things for Him. What was his answer?" Ask a volunteer to read the answer to the puzzle "Whatever you did for one of the least of these brothers and sisters of mine, you did for me." Engage the class in a conversation about who the "least of these brothers and sisters of mine" are. Ask the children what things Jesus did to show love to us and what things we can do to show Jesus' love to other people. Explain the activity, "Today, we're going to show the love of Jesus to some of the elderly. I have gathered a list of individuals to which we can send each a card to to let them know we are thinking of them. Simply choose a card and a name from the list, and write a short note or create a drawing for them." Allow each child to choose a card and name. If time permits, allow the children to create their own "Thinking of you" cards. Check that each child's card is appropriate before collecting them. If the class is old enough, have them address the envelopes and prepare them to mail. If not, properly address the envelopes and mail the cards.